Welcome to Non Fiction November. Are you ready for a month of reading diaries, dissertations and dramas as well as anecdotes, adventures and autobiographies. Our author flavors of the month are Truman Capote, Stacy Schiff and Bill Bryson. Yes, a rather eclectic grouping and it just so happens that I have those authors on my shelves. I'm actually not a huge fan of reading non fiction, except for writing books, Which makes it all the more interesting that I'm now leading a flash non fiction writing class utilizing Dinty's Moore's Rose Metal Press Field Guide to Writing Flash Non Fiction. I've stepped way outside my box and well as comfort zone with the writing exercises. 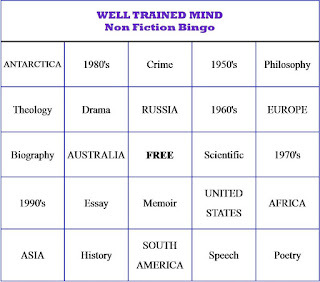 Which has lead to my wanting to read more non fiction. I've gathered quite a collection of world war history books as well as spy craft, thanks to my husband and son. Thanks to numerous recommendations, I now have Truman Capote's In Cold Blood, Stacy Schiff's Cleopatra, Bill Bryson's A Walk in the Woods, Susan Cain's Quiet as well as Erik Larson's Dead Wake and In the Garden of Beasts waiting in my stacks to be read. We'll see how far I get. Also, thanks to the ladies on WTM, Stacia and Rose, we have in the works for this month: a comparison reading of Shakespeare's The Winter Tale along with Jeanette Winterson's modern retelling The Gap of Time. 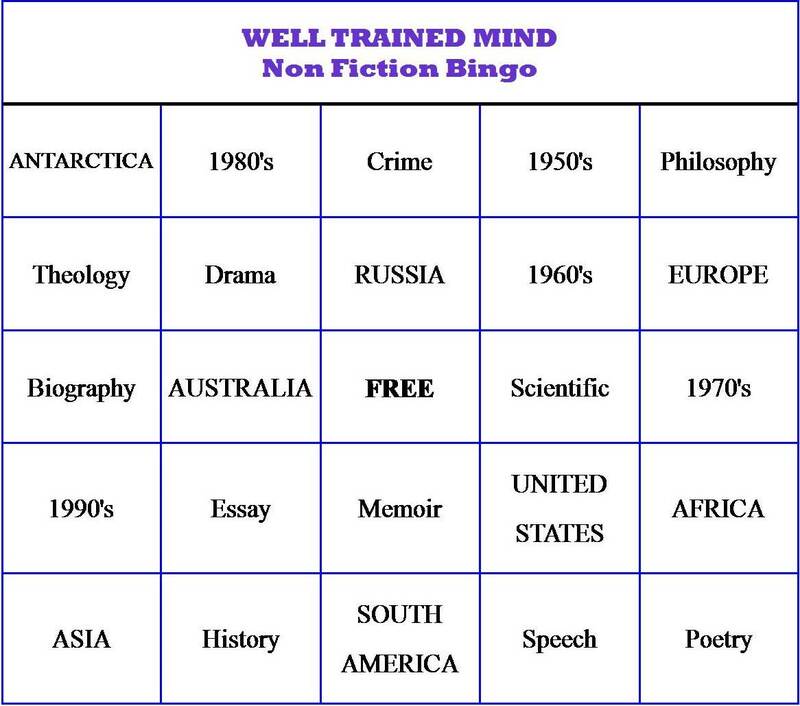 Join me in a game on Non Fiction Bingo, made especially for you all, and see how many bingo's you can complete, vertically, horizontally or diagonally. And if you want to get really creative, try a T or an L or an E.
I feels good to be back on track again with reading each week. Thank you for hosting the challenge! As it is Remembrance Sunday here tomorrow, I read a war related novel, 'The Undertaking' by Audrey Magee. It was unusual in that it was seen from the German perspective, quite a harrowing read, but an excellent debut novel.